Nourishing the mind, body and soul. What do you do when a 15 year old requests Fettuccine Alfredo for his birthday dinner? First you cringe a little because this pasta with cream and butter has virtually no nutritional value and is truly bland in flavor. Then you remember that even the Hungry Athlete loved Alfredo sauce when she was a kid. With Halloween around the corner, looks like the Hungry Athlete had to use a little witch craft to create a healthier version of a teen’s favorite meal. To ensure Briley’s birthday dinner would be a big treat, I had a couple tricks up my sleeve. The first trick was to sneak in vegetables (muhahahaha). 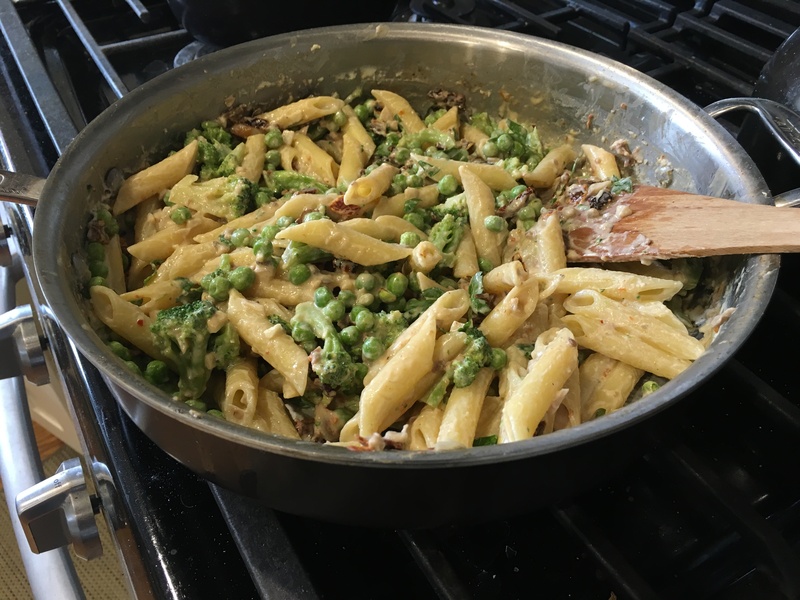 I loaded the pasta with four vegetables which have some of the best sources of vegetable protein: peas, broccoli, sundried tomatoes and mushrooms. In the version I made on Briley’s birthday, I confess to using a sleight of hand to hide the vegetables. I simply diced the vegetables into the size of peas. 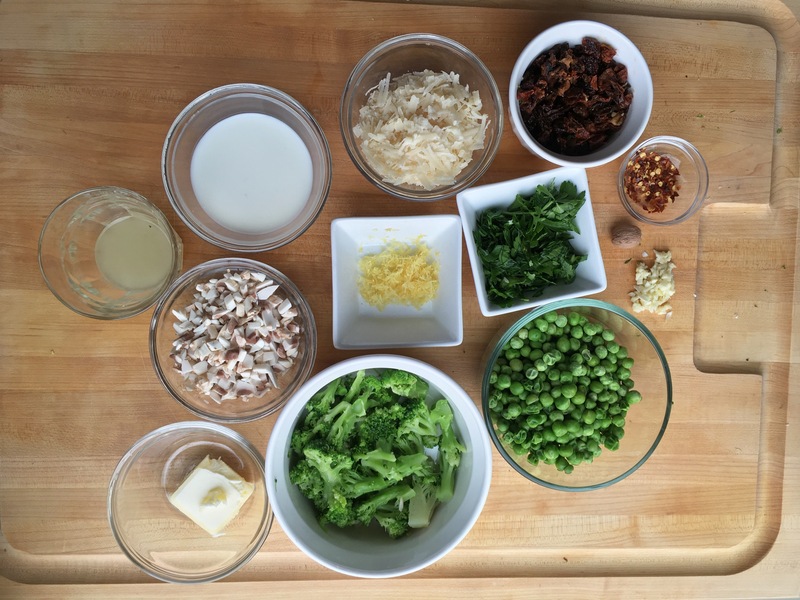 Now that my secret is out, the final recipe calls for larger bits of broccoli, mushrooms and sun-dried tomatoes. This makes the pasta more pleasing, both visually and texturally. The final trick is to turn the heavy cream into a disappearing act. Typical American Fettuccine Alfredo is made with 1 1/2 cups of heavy cream, 2 tablespoons of butter and Parmigiano-Reggiano, along with a pinch of nutmeg. I understand that the original and authentic Italian Alfredo sauce is made of only three ingredients: fettuccine, 2 sticks of butter (wow) and Parmigiano-Reggiano. Either way, that’s a lot of cream or butter. So instead of all the heavy cream, I threw into the cauldron some magic: Neufchatel. No I didn’t sneeze and my cauldron was actually a large All-Clad saute pan. Named after a town in Normandy, Neufchatel is one of the oldest of French cheeses and typically produced in the shape of a heart. According to cheese folklore, American cream cheese was created when an American dairyman added cream to the recipe for Neufchatel. Real French Neufchatel is made with raw cow’s milk. American Neufchatel is made with pasteurized cow’s milk and cream. 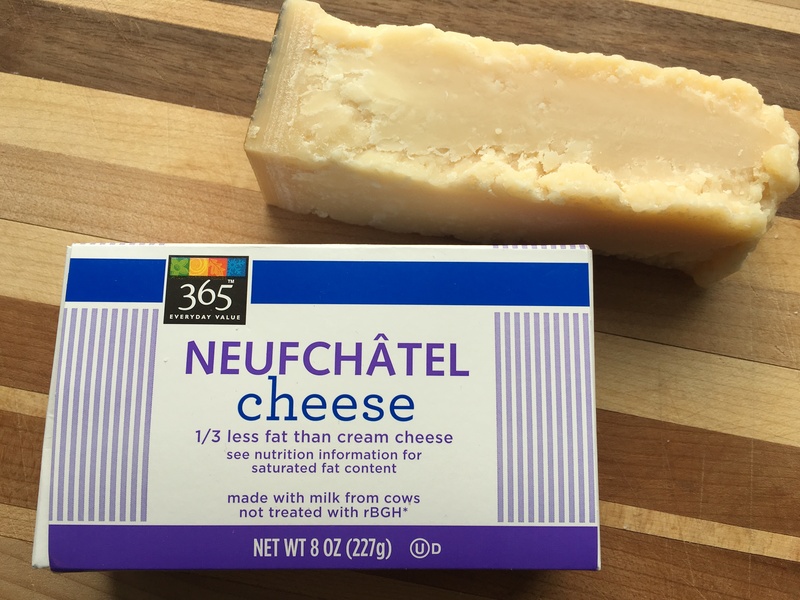 American Neufchatel has about 33% less fat than cream cheese and is sometimes called farmer’s cheese. Creamy and slightly tangy, it tastes a lot like cream cheese and a lot better than heavy cream. It is found next to the cream cheese in the grocery store. Neufchatel and Parmigiano-Reggiano combine with milk into a creamy Alfredo sauce. I was afraid of disappointing a teenager on his birthday and tested a version with a couple tablespoons of cream, a version with whole milk and a third version with low-fat milk. I found the milk versions to be creamy, rich and delicious. Happy birthday Briley! This sauce was created just for you, to keep you healthy and to fuel your workouts. May you continue to run those trails fast and strong for years to come. **Note: Non-fat or reduced fat milk requires additional processing to remove the fat and then to put the 1% or 2% fat back. I prefer less processed foods. Your taste buds can easily be adjusted from non or low fat to whole milk. ***Note: Sun-dried tomatoes in oil can be used however I prefer to use sun-dried tomatoes not in oil. These has a longer shelf life however need to be soaked in water for about 30 minutes before chopping and cooking. Timing is everything in this dish. As soon as the pasta is cooked it should be transferred directly to the pan with the Alfredo sauce. The ensure good timing, prepare all of the ingredients in advance then start cooking the pasta. If you are using dry pasta, allow 5 minutes to prepare the Alfredo sauce. If you are using fresh pasta, have a pot of water boiling and ready for the pasta and toss in the pasta just before you finish making the Alfredo sauce. To make the sauce, melt 1 tablespoon of butter in a large sauté pan over medium heat. Sauté the mushrooms for a couple minutes, then remove from pan and set aside. Melt the remaining butter in the same pan over medium heat. Add the garlic, red pepper flakes and lemon zest. Stir for 1 minute. Lower the heat and whisk in the Neufchatel, Parmigiano-Regiano and lemon juice until cheese is melted and smooth. Whisk in milk for 1 minute. Whisk in fresh nutmeg for another minute. 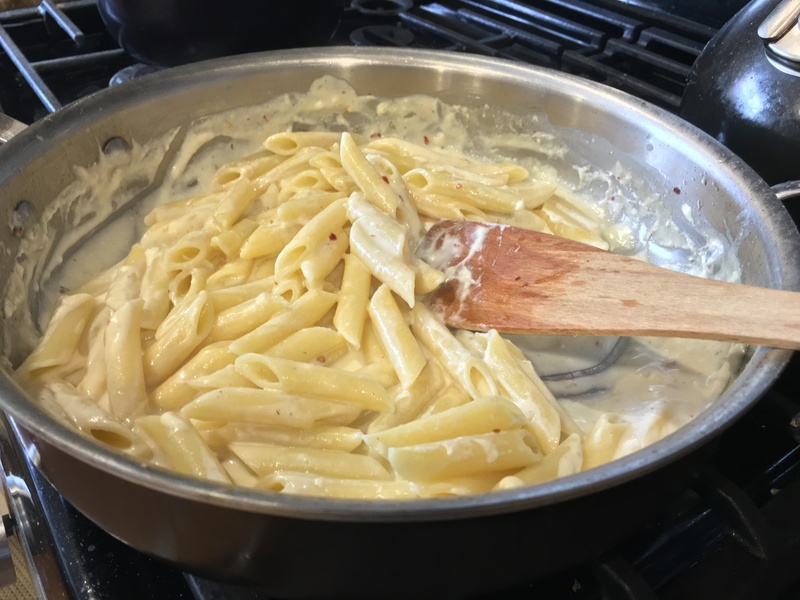 As soon as the pasta is cooked al dente, place it into the pan and coat the pasta with the Alfredo sauce over medium heat. Fettuccine is the traditional pasta used with Alfredo sauce. Here I used penne pasta. 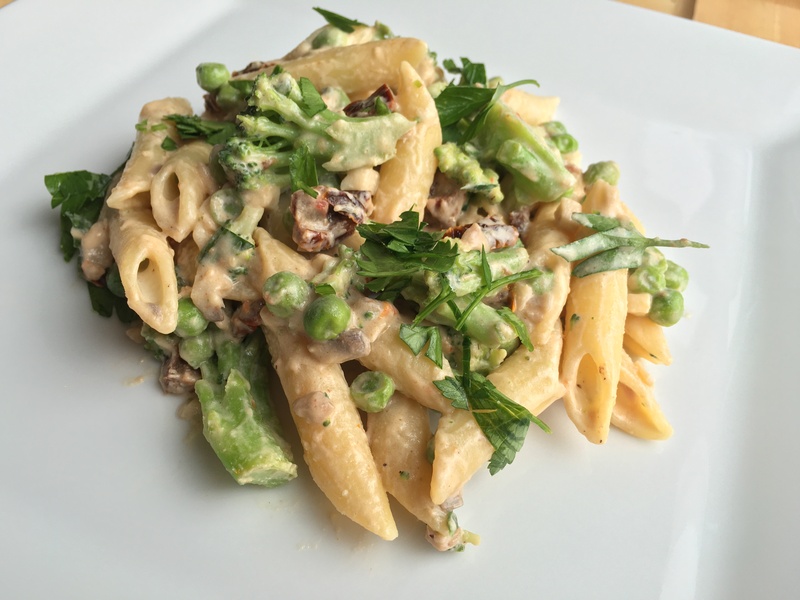 Toss in mushrooms, broccoli, peas, sun dried tomatoes and half the parsley. Serve immediately with remaining parsley garnished on top.